Bitcoin price dumped below the $3,500 support before buyers took a stand against the US Dollar. 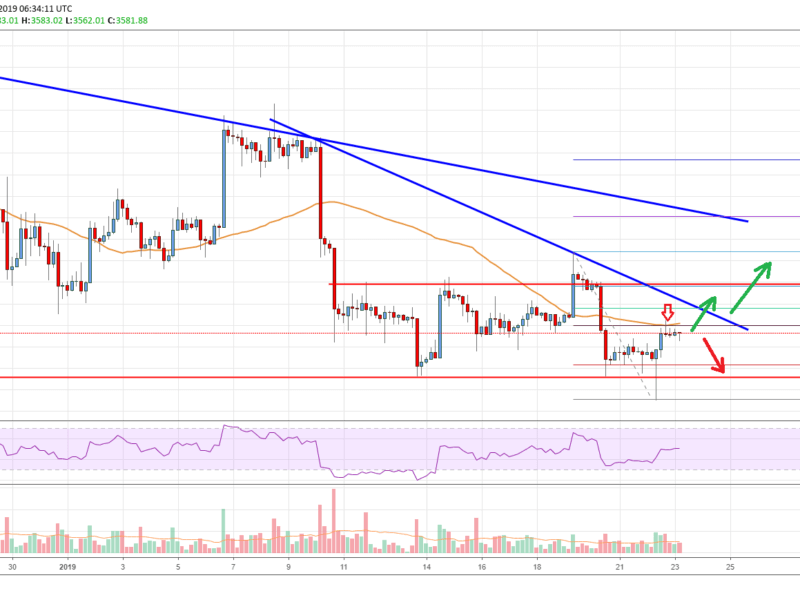 There are two bearish trend lines formed with resistance at $3,635 and $3,840 on the 4-hours chart of the BTC/USD pair (data feed from Coinbase). The price may climb higher in the short term if there is an upside break above $3,600 and $3,635. Bitcoin price is trading near key pivot levels against the US Dollar. BTC could accelerate gains if buyers succeed in gaining strength above the $3,600-3,635 resistance area. After trading as high as $3,771, there was a sharp bearish reaction in bitcoin price below $3,700 against the US Dollar. The BTC/USD pair declined below the $3,620 and $3,540 support levels. There was even a close below the $3,600 level and the 55 simple moving average (4-hours). Later, the price dived below the $3,500 and $3,460 support levels. A new yearly low was formed at $3,427 before the price started a decent upside recovery. It climbed above the $3,500 and $3,540 resistance levels. There was a break above the 23.6% Fib retracement level of the last slide from the $3,771 high to $3,427 low. However, the price faced a strong resistance near the $3,600 level and the 55 simple moving average (4-hours). Besides, the 50% Fib retracement level of the last slide from the $3,771 high to $3,427 low is acting as a solid hurdle. Finally, there are two bearish trend lines formed with resistance at $3,635 and $3,840 on the 4-hours chart of the BTC/USD pair. Therefore, at the first stage, the price must break the $3,600 level and the bearish trend line. Above $3,640, the price may climb towards the $3,800 level or the second trend line. Looking at the chart, bitcoin price is facing an uphill task near the $3,600 and $3,635 resistance levels. If BTC buyers fail to gain strength, the price could decline to $3,500 or $3,450. 4-hour MACD – The MACD for BTC/USD is about to move into the bullish zone, but with a flat structure. 4-hour RSI (Relative Strength Index) – The RSI is currently flat near the 50 level.